The Ebola virus is a serious and deadly disease transmitted by animals and humans. These virus cause hemorrhagic fever or profuse bleeding inside and outside the body, accompanied by a very high fever. 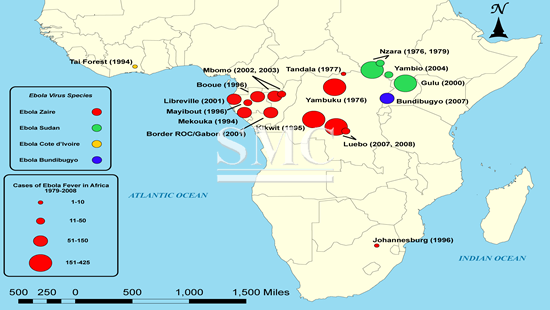 An outbreak occurred in March 2014 that began in West Africa. The Ebola virus does not have a cure or vaccine at this time. Instead, measures are taken to keep the person as comfortable as possible. According to the US Centers for Disease Control and Prevention, Ebola spreads through contact with the bodily fluids of an infected individual, or through exposure to contaminated objects. Studies showed that some viruses, similar to Ebola, are sensitive to a broad range of surface disinfectants. It was reported that copper could help preventing the spread of Ebola. According to a research on viruses of similar genetic structure, conducted by Bill Keevil from the University of Southampton in England, it is expected that copper surfaces may inactivate Ebola and help control the spread of this virus if applied for publicly-used touch surfaces. Clinical trials conducted in the UK, US and Chile have shown surfaces made from solid copper or copper alloys (collectively termed “antimicrobial copper”) continuously reduce surface contamination by greater than 80%. Antimicrobial copper surfaces have been described as a “no touch” solution, meaning that no special measures or human interventions are required for it to continuously kill pathogens. Replacing frequently-touched surfaces (door handles, taps and light switches, etc.) with solid copper or copper alloy will provide more hygienic environment, that may hopefully offer an additional method of controlling the current spread of Ebola.